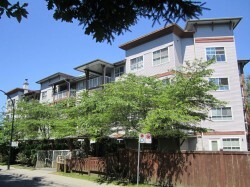 Chelsea Crossing is located at 3691 Vanness Avenue, on the edge of Burnaby and Vancouver. Built in 1997 by the West Coast Community Homes Society, the facility was acquired by New Chelsea Society in 2010. Close to public transportation at Joyce Skytrain station and just a five-minute walk from Burnaby Central Park and Swangard Stadium, this complex provides affordable housing in a relatively quiet neighborhood. 31 family housing apartments with a mix of 2, 3 and 4-bedroom units. Common room for meetings and parties and an enclosed playground. Close to Burnaby Central Park. Laundry rooms; plumbing hookups available in some units for residents who bring laundry machines.